Due to Santa Monica's close proximity to Los Angeles, it is easy to travel to this coastal resort and visitors to Santa Monica can make use of LA's excellent transport infrastructure. Los Angeles International Airport (LAX) serves the Santa Monica area, with numerous flights to world-wide destinations. Visitors can arrive at this major air transport hub and then travel to Santa Monica in less than 30 minutes. Greyhound and Amtrak transport operate services to LA, from where local bus connections travel to Santa Monica. Alternatively visitors can make use of LA and Santa Monica's plentiful taxis, which are reasonably priced. Los Angeles International Airport (LAX) is less than a 30-minute drive from Santa Monica, making air access to the resort easy. As one of the busiest airports in the US, LAX offers daily flights to major US destinations, as well as frequent connections with Africa, Asia, Europe and beyond. Shuttle bus transport and taxis operate from the airport, providing convenient ways to travel into nearby Santa Monica, while there are also a number of car rental agencies present. 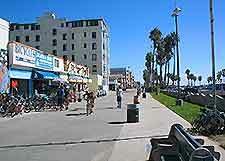 Santa Monica has a number of reputable car rental transport agencies offering reasonable prices. Offices can be found in downtown Santa Monica or alternatively visitors may choose to rent a car upon their arrival at Los Angeles International Airport (LAX), where Hertz, Avis and Budget among others are represented. 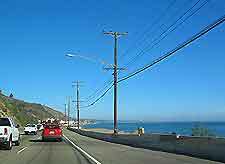 Highway 10 provides road travel between Los Angeles and Santa Monica, while Highway 405 connects Santa Monica with other coastal destinations. Book your Santa Monica Car Rental here. Greyhound offers frequent services between Los Angeles and other major US destinations, with terminals located in downtown LA, Hollywood, Pasadena, North Hollywood, Long Beach and Anaheim. Local MTA buses operate from these terminals, providing travel to and from Santa Monica and other LA destinations. All of the Greyhound terminals offer toilets and lockers. Los Angeles' famous Union Station is the main Amtrak terminal, from where there are frequent connections with other US cities. While Santa Monica itself is not connected by rail, visitors can travel to LA by train, from where they can take a taxi or use connecting bus transport for the final stretch of the journey to Santa Monica. Several taxi companies operate in and around Santa Monica, providing a convenient way to travel around the resort. Taxis can either be hailed in the street or pre-booked by telephone and are easy to find outside prominent hotels in Santa Monica's downtown area.